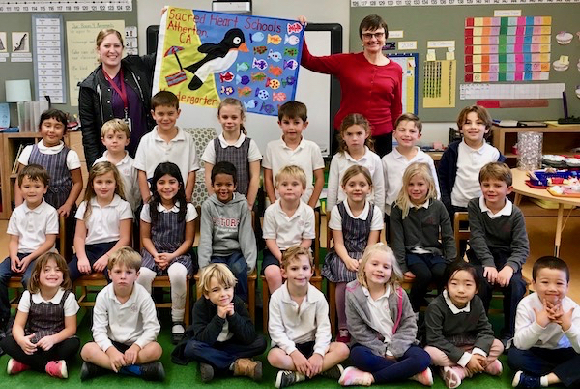 As part of Global Studies in the preschool and kindergarten, Sacred Heart Schools’ (SHS) two kindergarten classes undertook a first-of-its-kind project that made their education about Antarctica all the more tangible. 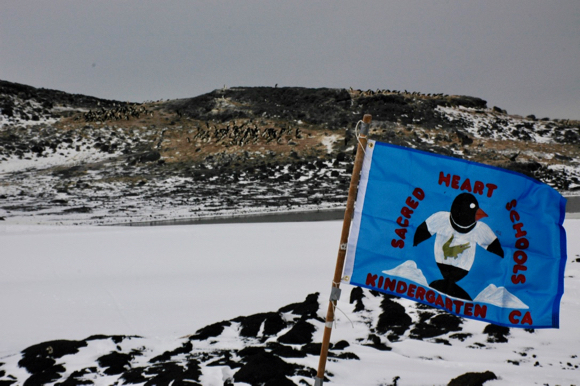 Each class designed and painted a SHS- and penguin-themed flag which was mailed to Antarctica and displayed by researchers at the remote Cape Royds Penguin Colony near the famed McMurdo Station. The research station invites school children from around the world to submit flags. “It helps them brighten up their gray and black world, as they say,” said Kindergarten teacher Megan DeRitis, who began spearheading the project last academic year to roll out this winter. PSK students study each of the seven continents, “and we wanted to reimagine what the Antarctica unit could look like,” said DeRitis. Students begin learning about Antarctica in preschool. “They know it’s cold, that penguins live there, that there are no cities or regular houses, that it’s basically scientists studying penguins, plants, climate, and the atmosphere,” said Kindergarten teacher Carol DeZutti. One of the researchers is Jean Pennycook, an educator and scientist who studies Adélie penguins and makes it her mission to share what her team is discovering. Pennycook signed the flags before returning them on the 10,000-mile journey back to Sacred Heart Schools. The children watched a video of Pennycook and learned about life at a research station. “They were so excited about it, saying, ‘that’s the lady who signed our flag! If we touch this flag, we’re touching a part of Antarctica!’” said DeRitis. 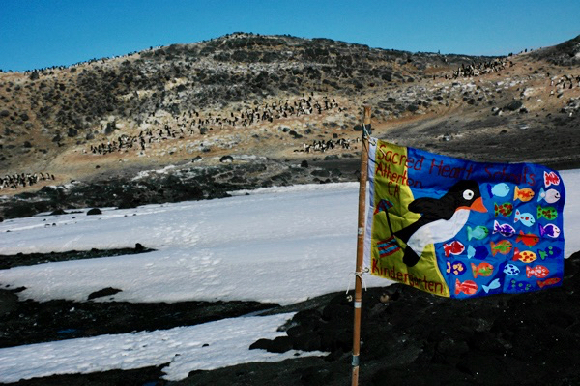 The flag endeavor was integrated with a popular, years-long tradition within the Antarctica unit: painting life-size penguins of the seven species that live or breed around the coast of Antarctica. Painting the flags, however, brought an entirely new element to their studies, as collaboration skills were honed. Kindergarten teachers Soraya Chowdhury and Whitney Infelise sketched out the designs, and working together over the course of several days, the students chose and painted the background color, top colors, and details like the eyes and mouth of penguins — one of whom wore “gator gear” in a nod to SHS’s mascot.